Award winning pianist services by Twin Cities Event Pianist, Sharon Planer. Pianist for Parties Sharon Planer receives The Knot Best of Weddings 2018. 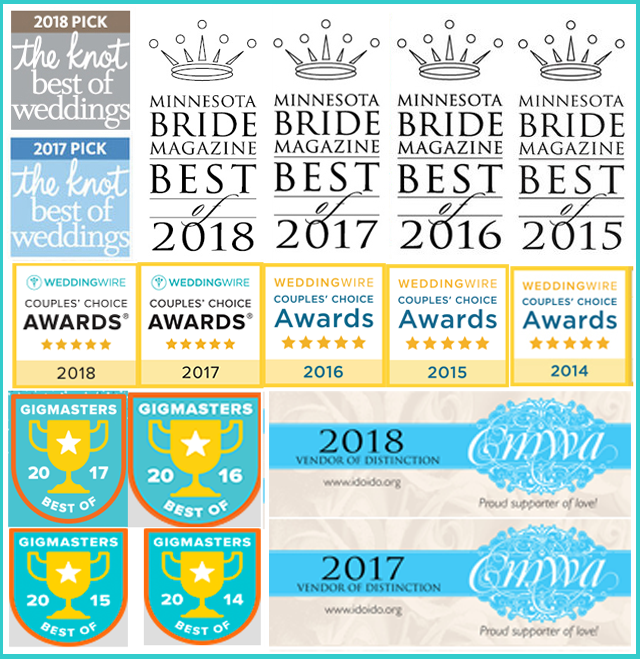 Minneapolis, MN/January 9, 2018—Sharon Planer is pleased to announce that she has been selected as a 2018 ­­winner in The Knot Best of Weddings, an award representing the highest-rated wedding professionals as reviewed by real couples, their families and wedding guests on The Knot, the leading online wedding brand and app. This is the 3rd year Pianist for Parties Sharon Planer has been selected for The Knot Best of Weddings. “Creating a beautiful musical atmosphere is my passion! I love helping each couple find the perfect music for their special day. Choose from a repertoire of elegant ceremony music, jazzy cocktail tunes, and romantic dinner songs. I welcome requests! Portable piano available. I perform in the Twin Cities, Minneapolis, St. Paul, and central Minnesota. I have the 'KEYS' to make your wedding sparkle with music!” - Sharon Planer, Owner, Pianist for Parties. Sharon began playing dinner piano music at the Garden Court Restaurant and the French Cafe in the heart of Minneapolis, Minnesota. For over 20 years Sharon has been a piano player for private and corporate events at clubs, restaurants, resorts, hotels and private venues in Minneapolis, St. Paul and throughout central Minnesota, including St. Cloud, and the Brainerd resort area. In January of 2001 Sharon launched 'Pianist for Parties' and her client list has continued to grow every year. Sharon finds it so rewarding when prior clients hire her again! She loves knowing that her music made enough of an impact the first time to be asked to return. Pianist for Parties WeddingWire winner! WeddingWire Couples' Choice Awards® recipients represent the top five percent of wedding professionals on WeddingWire who demonstrate excellence in quality, service, responsiveness, and professionalism. Readers of the Minnesota Bride magazine selected Sharon Planer to be 'THE' WINNER in Best Ceremony Music category for 2017! This article appeared in the Minnesota Bride Magazine Fall/Winter 2017 /2018 issue. Pianist Sharon Planer receives the Gigmasters BEST OF 2017 Award..
Minneapolis, MN /January 10, 2018 – Sharon Planer is pleased to announce that she has been selected as a winner of the GigMasters’ Best Of 2017 Award. This highly sought-after award by GigMasters, honors those vendors that have earned 4 or more reviews of 4 stars or higher in 2017. Creating a beautiful musical atmosphere is Sharon's passion! She loves to design her piano music to capture the theme and mood of each event. Portable piano available. Clients have been hiring Sharon Planer through Gigmasters for over 16 years. Visit online at http://pianistforparties.com/ to listen to her music, get prices and read client comments. Serving Minneapolis, St. Paul and throughout central Minnesota. Sharon Planer has the 'KEYS' to make your event sparkle with music! “As the leading marketplace for searching and booking all your party entertainment needs, we’re thrilled to honor those companies that our users continue to book again and again,” said Alison Bernstein, General Manager of GigMasters. Minneapolis, MN/January 5, 2017— Sharon Planer is pleased to announce that she been selected as a 2017 ­­winner in The Knot Best of Weddings, an award representing the highest-rated wedding professionals as reviewed by real couples, their families and wedding guests on The Knot, the leading wedding brand and marketplace. “I appreciate the many couples that helped me win this award by taking the time to thoughtfully describe what they enjoyed about hiring me as their wedding ceremony and reception pianist. I feel honored to have helped make their wedding day special with my music!” Sharon Planer, Owner, Pianist for Parties. The Knot has inspired approximately 25 million couples to plan a wedding that’s uniquely theirs. With a rich history of providing quality content and inspiration to couples, The Knot is making it easier for couples to connect with and book just the right wedding professional to create their perfect wedding day. Eight out of 10 couples come to The Knot where they can be connected to any of 300,000 local wedding professionals across the country. The Knot marries great technology with trusted content--and a little love--to make planning for the most important day of a person's life easier and more enjoyable. Creating a beautiful musical atmosphere is Sharon's passion! Sharon loves helping each couple find the perfect music for their special day. She will add beauty to your wedding with her elegant ceremony music, jazzy cocktail tunes, and romantic dinner songs. Portable piano available. Sharon performs in the Twin Cities, Minneapolis, St. Paul, and central Minnesota. Sharon has the 'KEYS' to make your wedding sparkle with music! The Knot is the nation’s leading wedding resource and marketplace that seamlessly engages, matches and connects couples with the right products, services and local wedding professionals they need to plan and pull off their wedding. The trusted brand reaches a majority of engaged couples in the US through the #1 wedding website TheKnot.com, its mobile apps, The Knot national and local wedding magazines, and The Knot book series. The Knot has inspired approximately 25 million couples to plan a wedding that’s uniquely them. The Knot is the flagship brand of XO Group Inc. (NYSE: XOXO), which helps people navigate and enjoy life's biggest moments—from getting married to moving in together and having a baby. Please visit The Knot online at TheKnot.com and follow on social media: Facebook.com/TheKnot and @TheKnot on Twitter, Pinterest and Instagram. 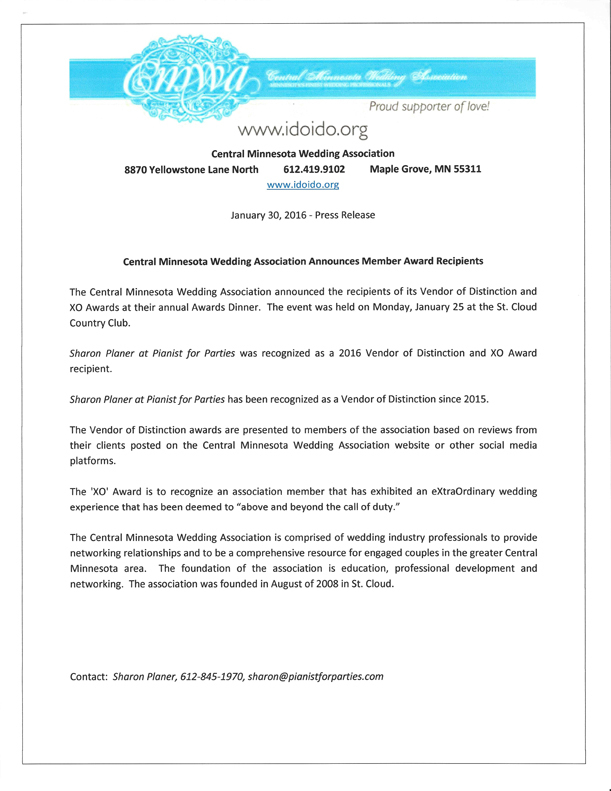 On Jan. 23, 2017, Sharon Planer was presented with the 2017 Vendor of Distinction Award at the Central Minnesota Wedding Association Annual Banquet at the St. Cloud Country Club. Readers of the Minnesota Bride Magazine selected Sharon Planer to be THE WINNER in Best Ceremony Music category for 2016! This article is printed in the Minnesota BRIDE Magazine Fall/Winter 2016 / 2017 issue. Well done, Sharon! You’ve been awarded the GigMasters’ Best of 2016 badge! This elusive award recognizes those GigMasters members, such as yourself, who have received 4 or more client reviews of 4 stars or higher in 2016! Congratulations! Thanks! We couldn’t be our best without our best members like you. PRESS RELEASE - SHARON PLANER of MINNEAPOLIS, MNhas been recognized by GigMasters.com as a ‘Best Performer of 2016’! GigMasters, founded in 1997, is among the internet's very first transactional marketplaces and where party planners and party entertainers alike come together to broker a booking. SHARON PLANER has won the GigMasters prestigious ‘Best Of’ award by securing 4 or more Verified Reviews of 4 stars or higher on GigMasters’ site. A GigMasters member may only receive a review from clients who are verified to have booked and paid them through the GigMasters platform. Their excellence has been recognized by their happy clients and the whole GigMasters community. Congratulations! Pianist For Parties, Sharon Planer, has won GigMasters' Best of 2015! This annual award is given to GigMasters members who have earned four reviews or more during the course of the past year, each with a rating of four or more stars, from confirmed GigMasters bookings. We’re recognizing our members who went above and beyond to satisfy their clients in 2015. Way to get the party started! Sharon has received over 120 reviews posted at GigMasters from satisfied clients that have hired her through GigMasters. Read what her clients have to say about her award winning music services! 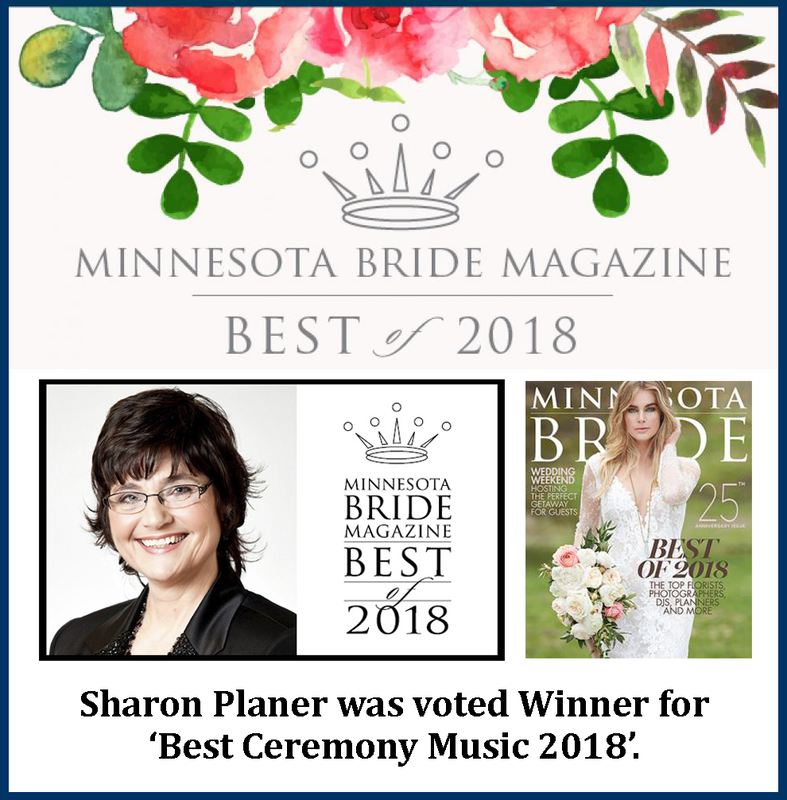 Minnesota Bride Magazine's Best of 2015 announces Pianist for Parties Sharon Planer the winner in Best Ceremony Music category! pianist for parties sharon planer - was voted the winner for Best Ceremony music. This article is printed in the Fall/Winter Minnesota Bride Magazine. Minnesota Bride Magazine states, "Thousands of our readers have weighed in, casting their votes to honor the top local wedding professionals in Minnesota Bride’s Best of 2015." January 21, 2015 – WeddingWire, the nation's leading online wedding marketplace, is thrilled to announce that PIANIST FOR PARTIES has been selected as a winner of the prestigious WeddingWire Couple's Choice Awards® 2015 for Wedding Musicians in Minneapolis, Minnesota! The WeddingWire Couples' Choice Awards™ recognizes the top 5 percent of local Wedding Professionals from the WeddingWire Network throughout the United States and Canada that demonstrate excellence in quality, service, responsiveness and professionalism. 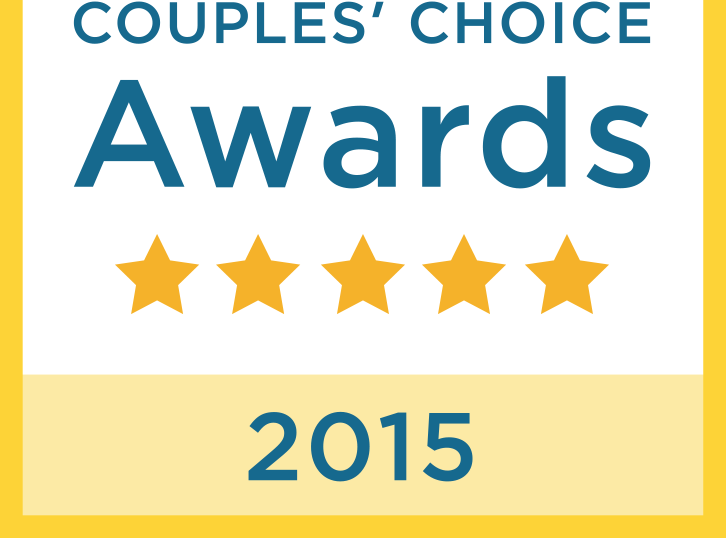 Unlike other awards in which winners are selected by the organization, the WeddingWire Couples' Choice Awards™ are awarded solely based on the reviews from over 200,000 newlyweds. Awards are determined by a combination of excellence in four factors: overall rating (quality), total number of reviews (quantity), review performance from 2014), and consistency of reviews from year to year (consistency). Congratulations! Pianist For Parties, Sharon Planer, has won GigMasters' Best of 2014! This annual award is given to GigMasters members who have received five or more client reviews (of four stars or higher) over the course of the last year. We’re recognizing our members who went above and beyond to satisfy their clients in 2014. Way to get the party started! Sharon has almost 100 reviews posted at Gigmasters. Read what her clients have to say about her award winning music services! Congratulations! Pianist for Parties has been awarded the 2014 Perfect Wedding Guide Preferred Vendor Award. This special honor is reserved for PWG advertisers who received 3 or more positive reviews during the 2014 calendar year. Congratulation to Pianist for Parties for being nominated as One of the three finalists for 'Best of Ceremony Music' 2014 by Minnesota Bride Magazine!